My family got together to celebrate my Dad (and Mom’s) birthdays today for some pizza and some basketball. Since we were celebrating my Dad, he got to pick the desert. 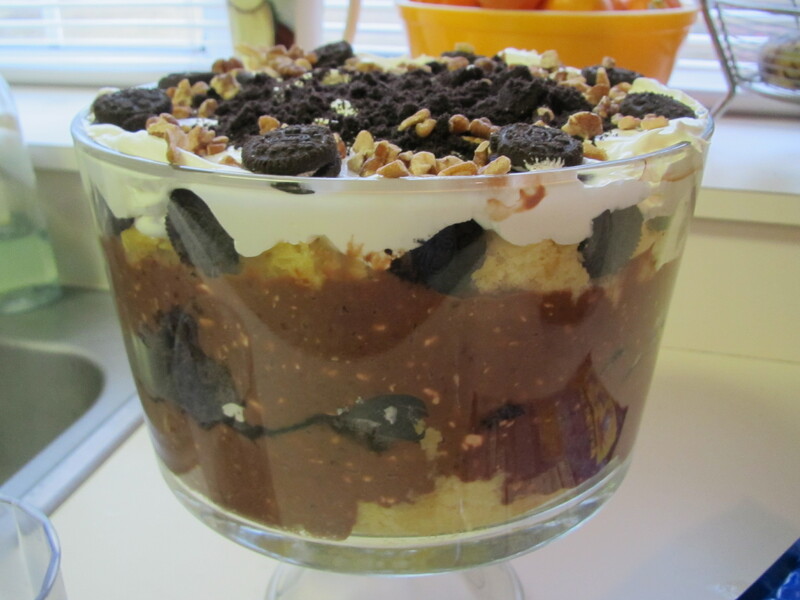 He requested a trifle…not to rich, but no fruit, and maybe something crunchy like nuts. Ok…I can do that! 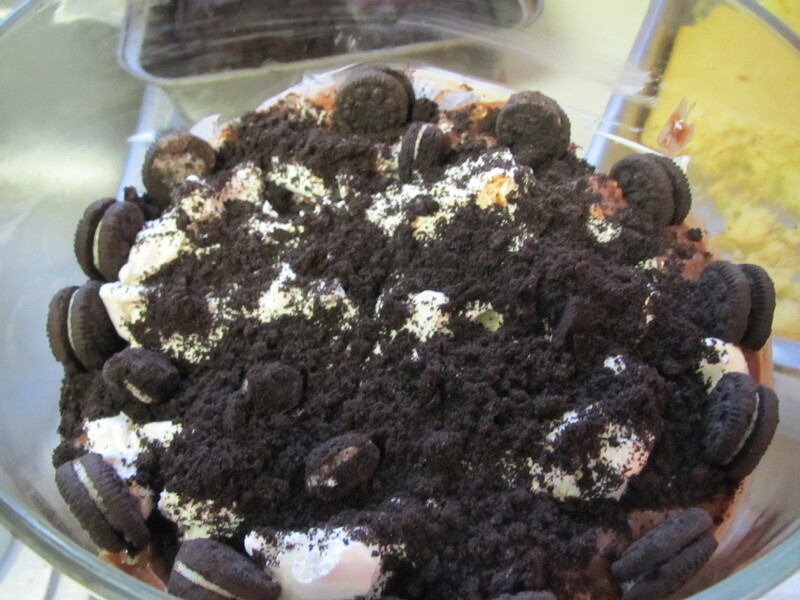 I chose to make an Oreo trifle. 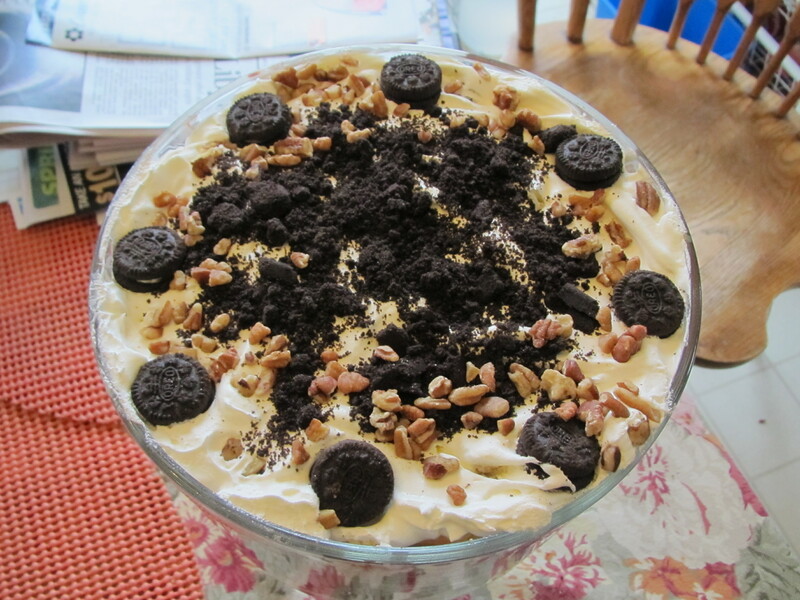 I have made a few trifles in the past and I always have fun making them. You can get as creative as you want and the ingredients are simple! Every time I mention bringing a trifle, someone jokes about the Friends episode where Rachel attempts a trifle. I was never a huge Friends fan, but as I gather she combined some dessert and some meat from another recipe. 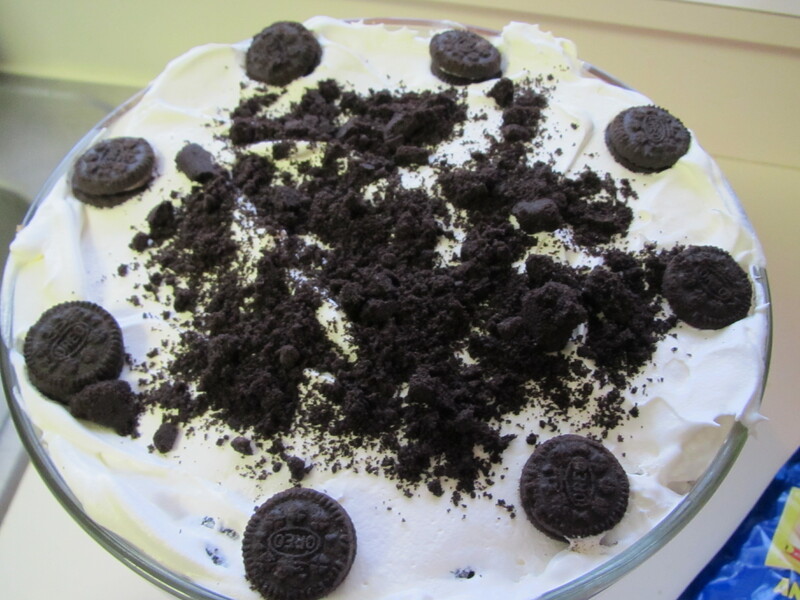 Luckily, my trifles always turn out better than that and I have never met anyone who doesn’t like the tasty combination of cake, pudding, and Cool Whip! 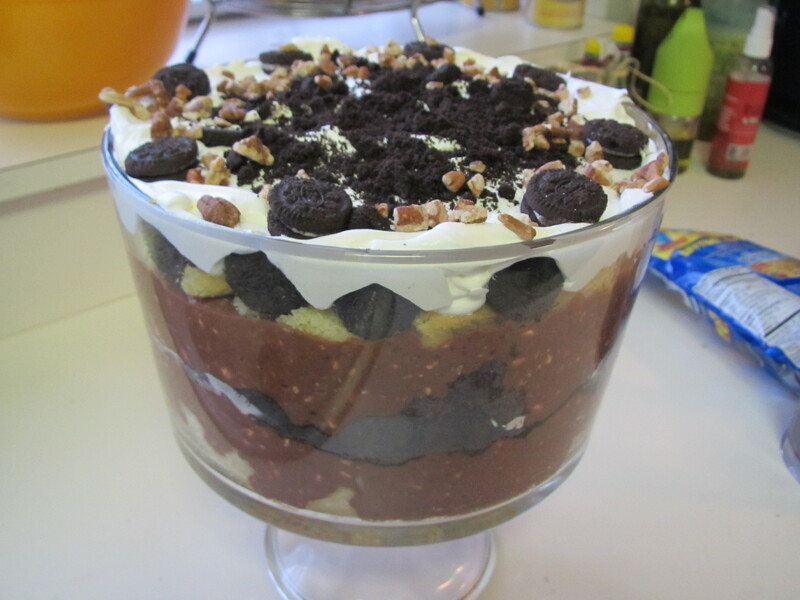 I am going to share today’s trifle concoction with you (which was a real crowd pleaser). No recipe involved, so feel free to substitute in whatever you want! 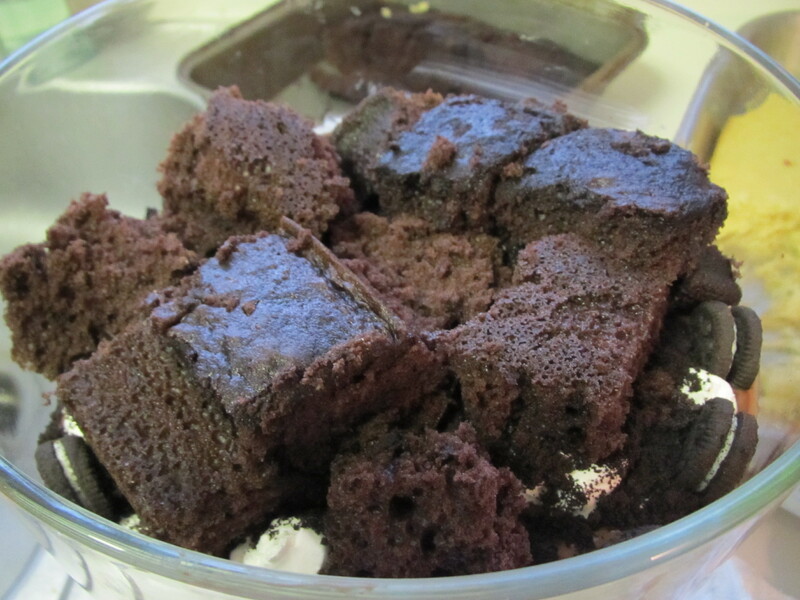 I chose to use chocolate fudge and a yellow cakes as my base. 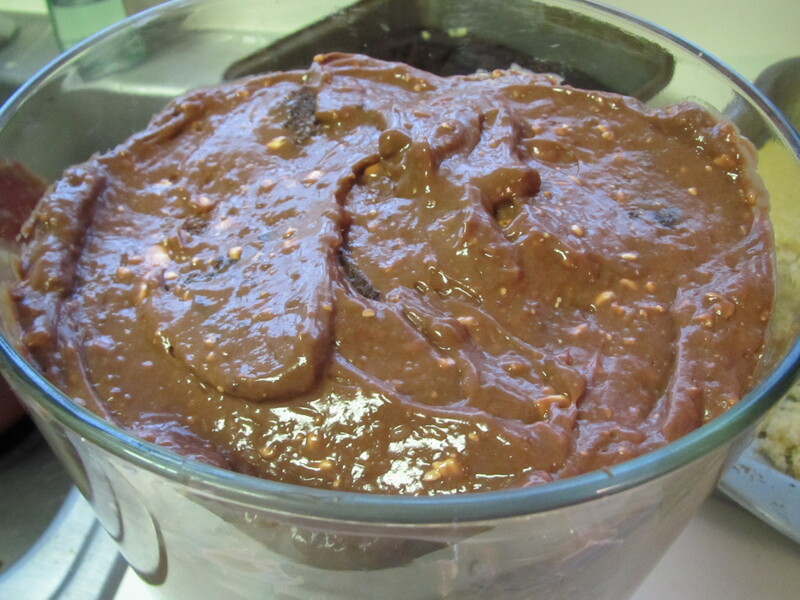 In the past, I have also used brownies or pre-made pound cake. 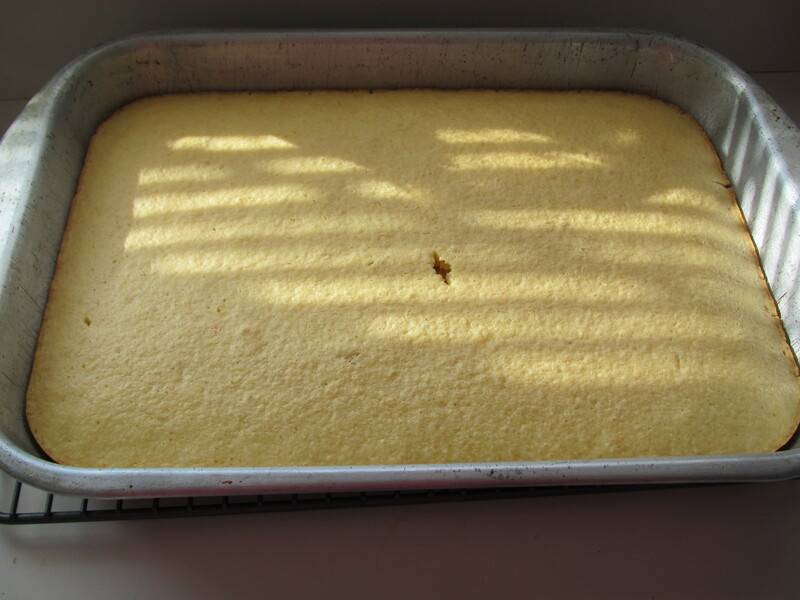 I made the chocolate cake per box directions and used this fabulous Hungry Girl recipe for the yellow cake. 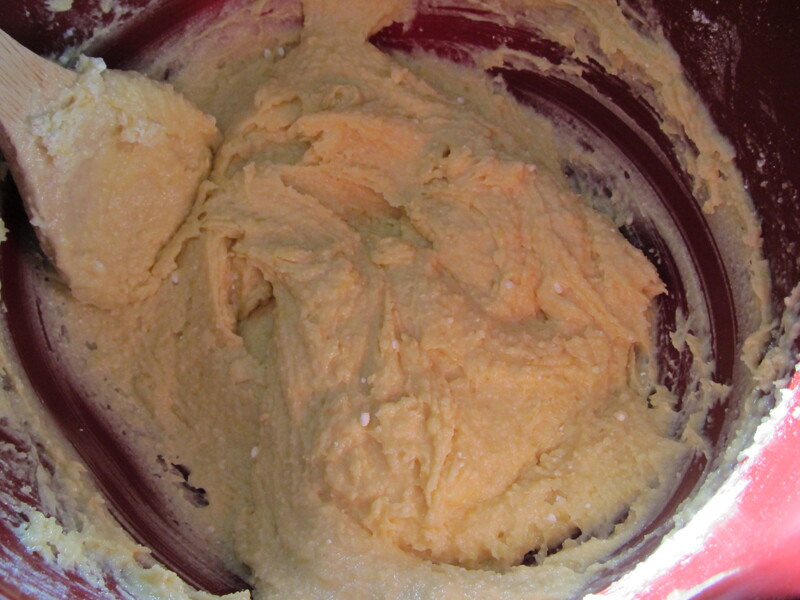 I highly recommend it the next time you are looking to make a cake, but I warn you…it is so delicious and dangerous. 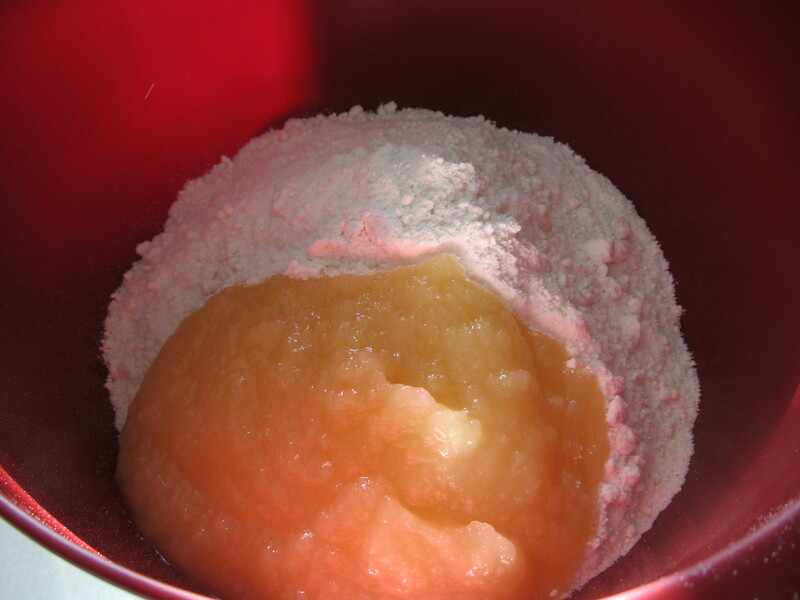 You begin by combining your cake mix and 1 cup of unsweetened applesauce. Mix well until blended. This will look thick with a few lumps. 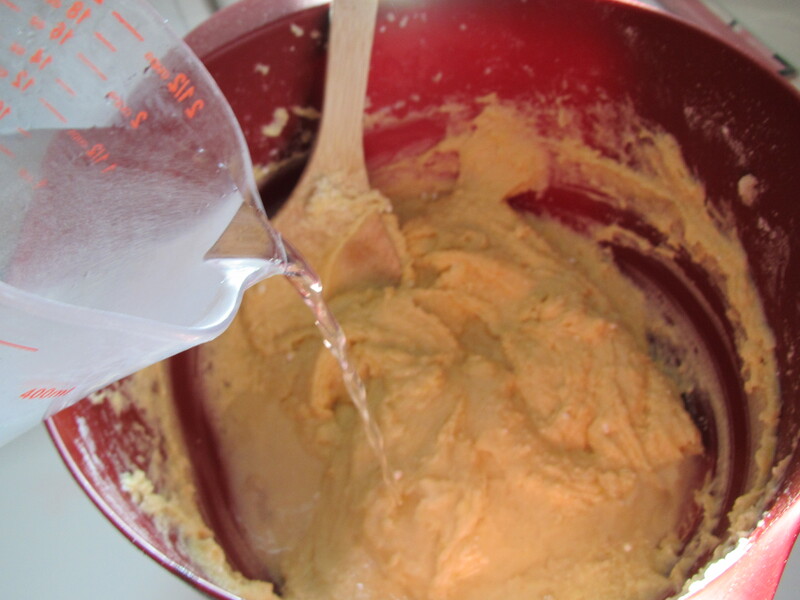 Then whisk in 1 cup of water. 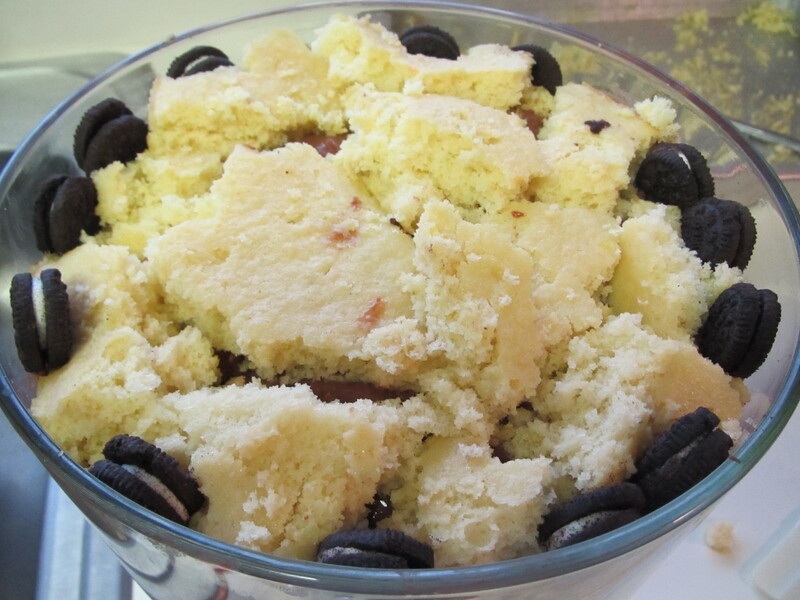 Spread on a greased cake pan and bake per directions on the box. 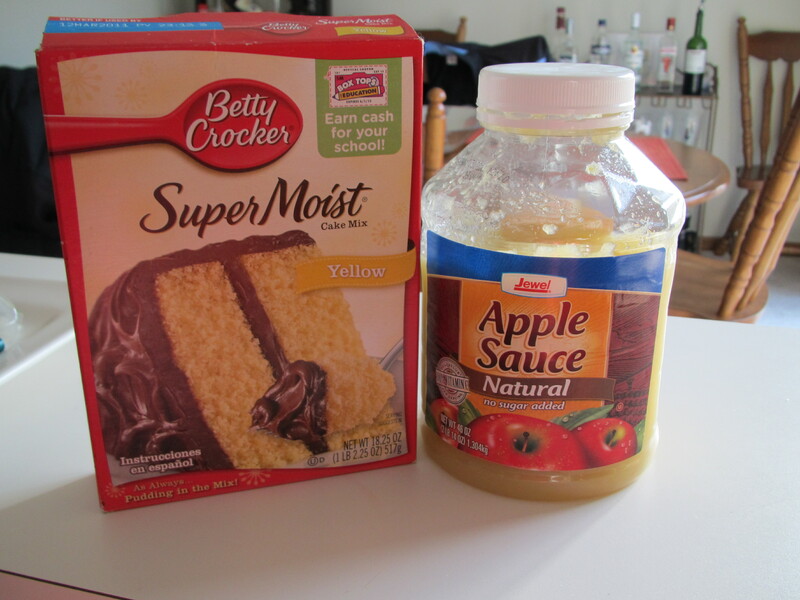 The cake tastes nothing like applesauce and is super sweet and moist! 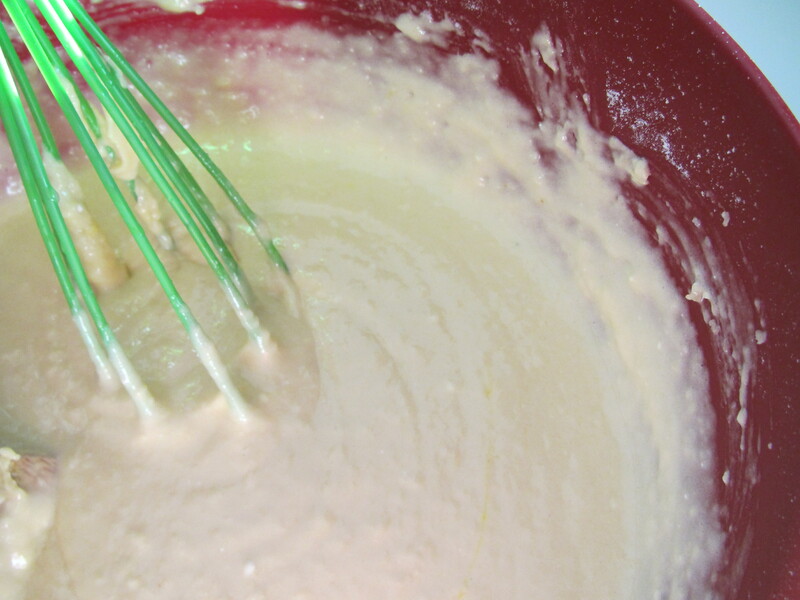 You can use this technique with any cake mix, but HG suggests yellow cake. 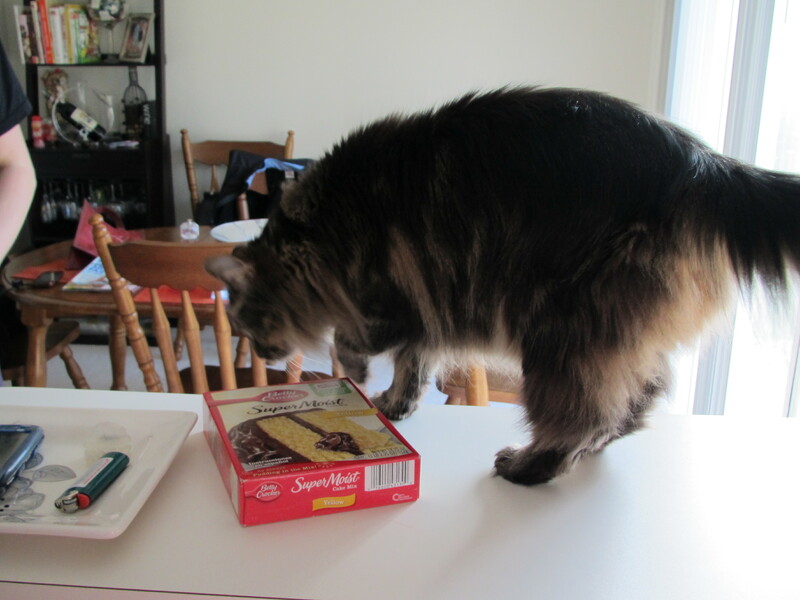 Look who came to help with the baking! 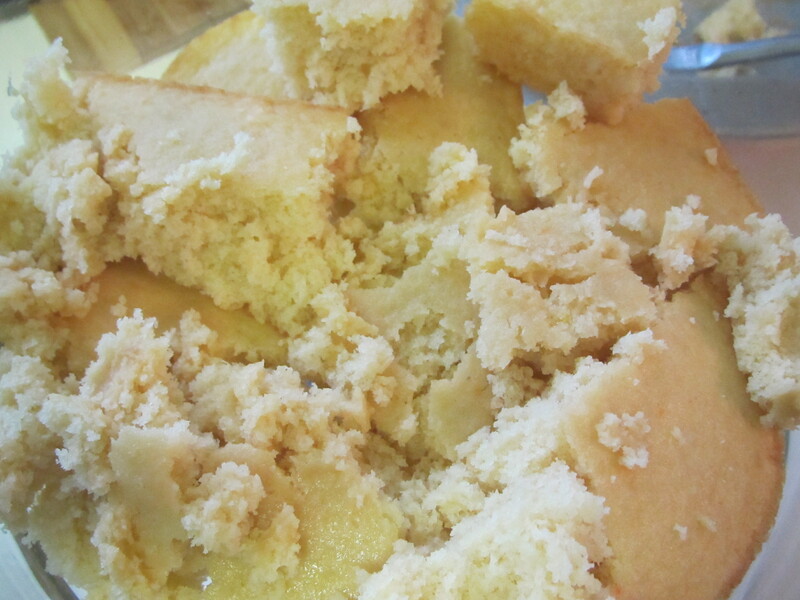 It looks like a typical yellow cake, but the taste and texture are fabulous! Especially with the trifle! 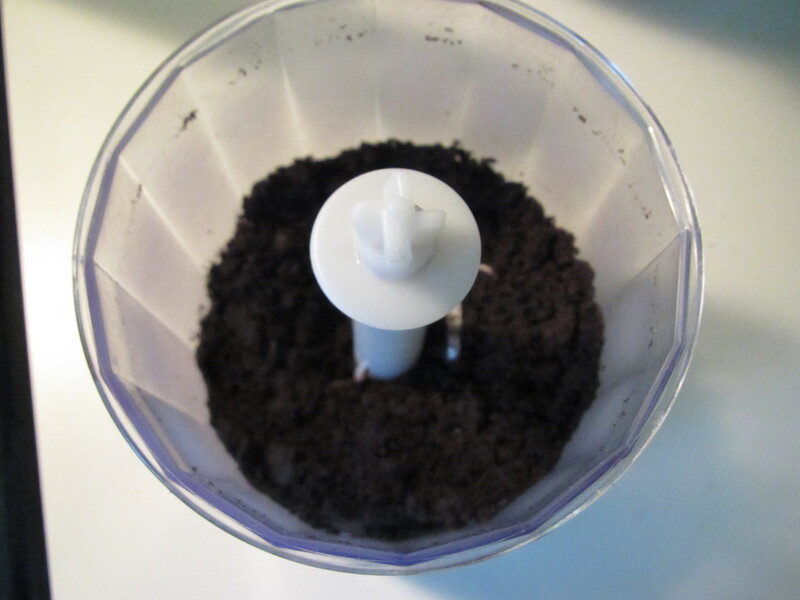 I used my immersion wand, which also happens to be a chopper to create some Oreo crumbs. 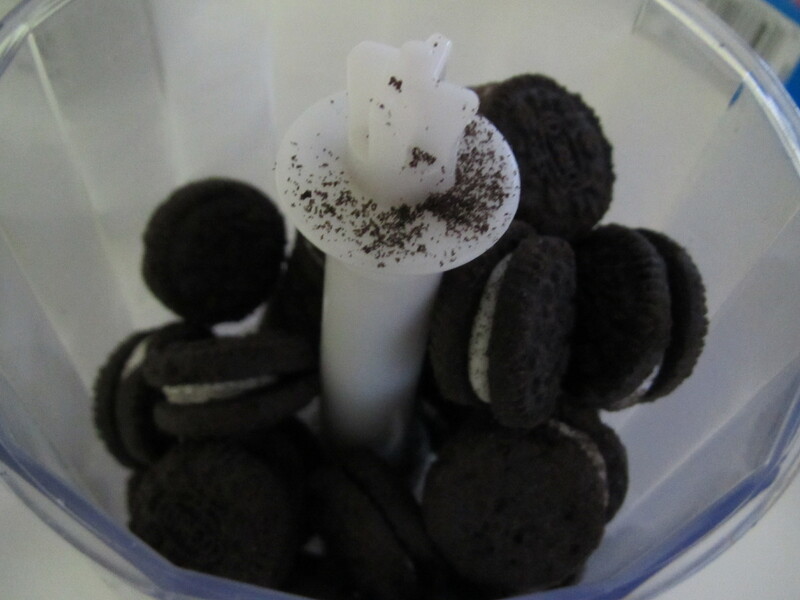 I used the small snack sized Oreos (because I had a coupon) and because they are super cute to decorate with. 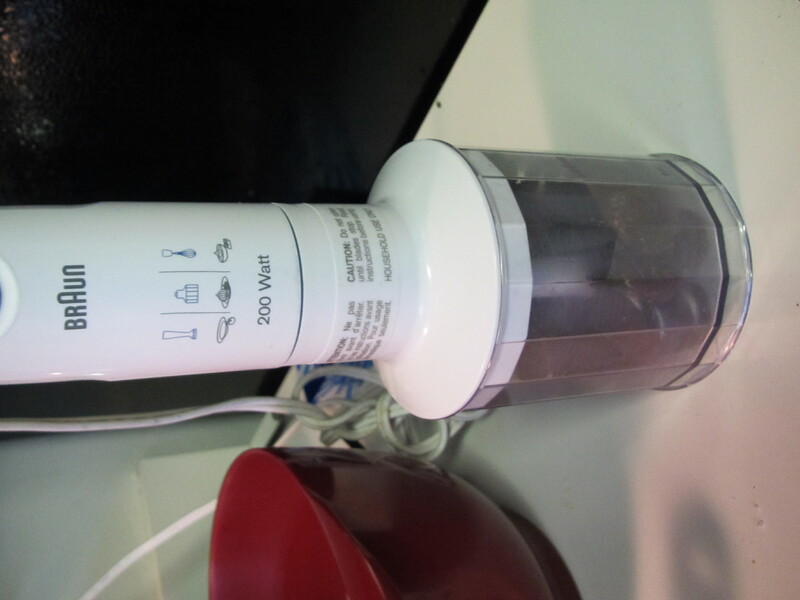 Is this not the best kitchen gadget ever? 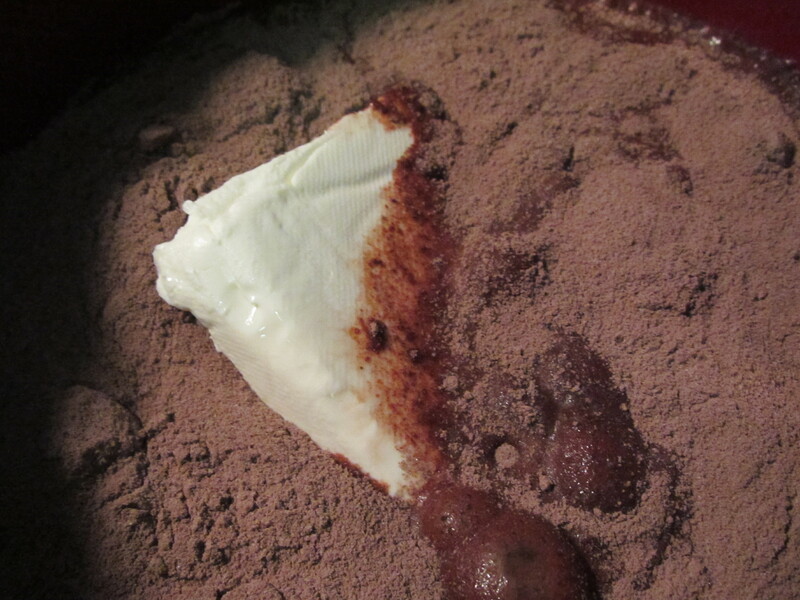 To make the chocolate pudding, I combined 1 large box of sugar-free INSTANT pudding with 3 cups of milk and 6 oz of Neufchatel cheese (at room temperature). 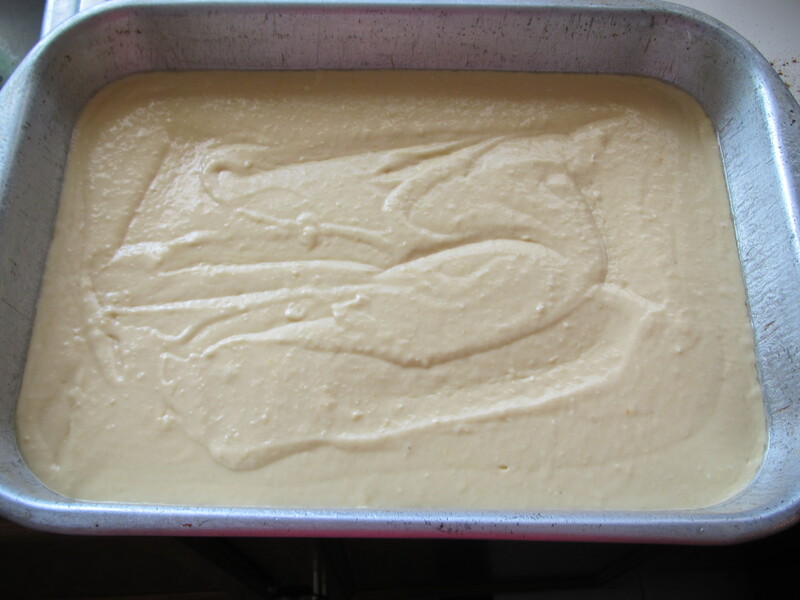 The cheese thickens up the pudding a bit. 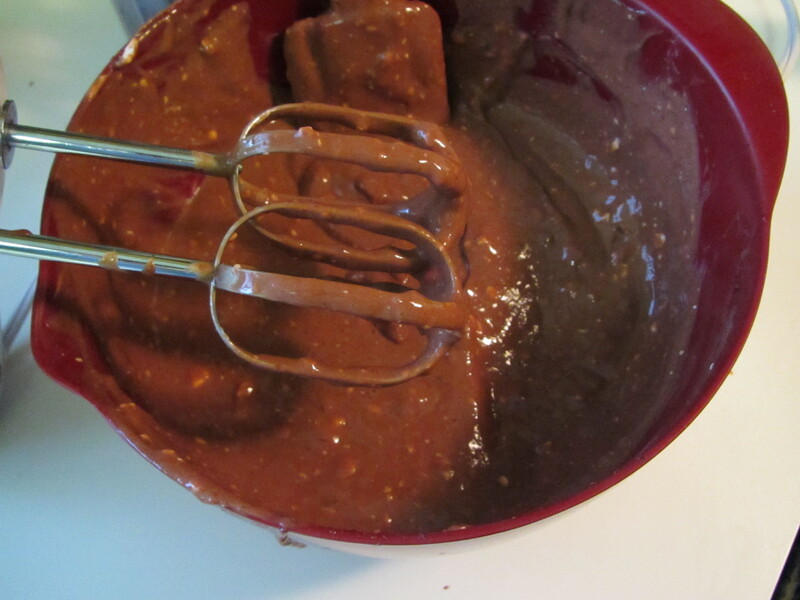 Since I had the wand out, I tried using the whisk to combine everything. 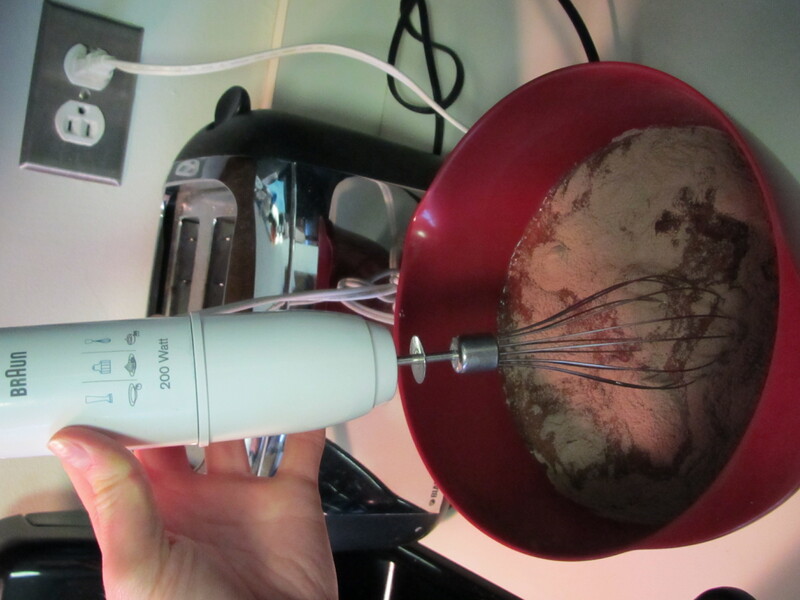 Chocolate pudding went in ALL directions, so I switched to my hand mixer. Since you can control the speed, this worked out much better. 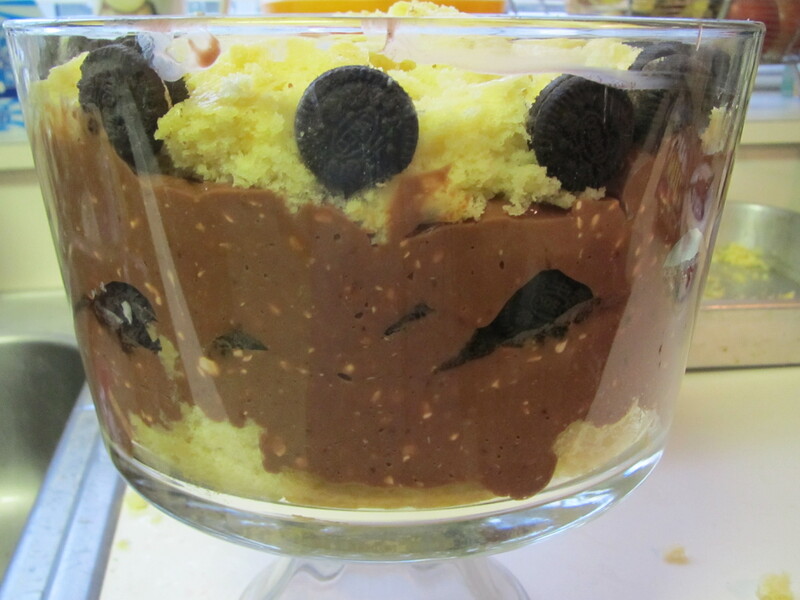 Once combined, your pudding will still be lumpy. 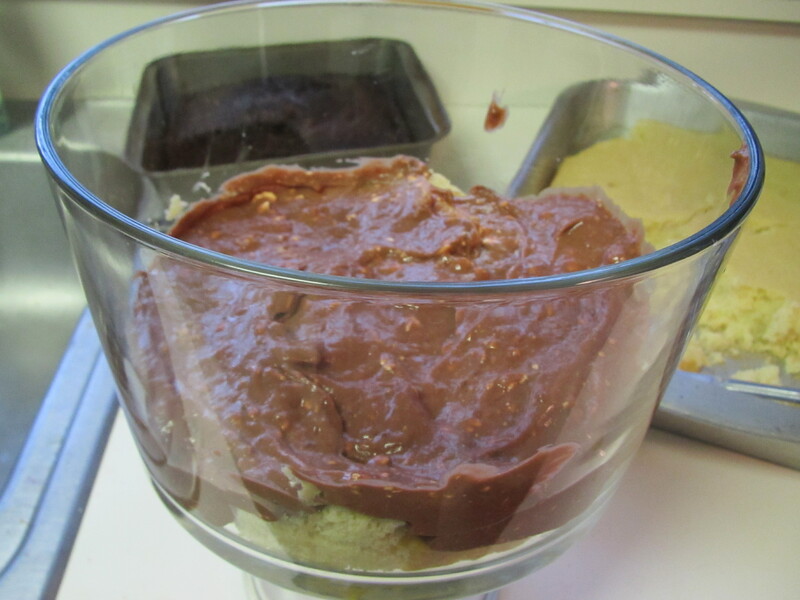 Now the fun part begins…assembling the trifle! 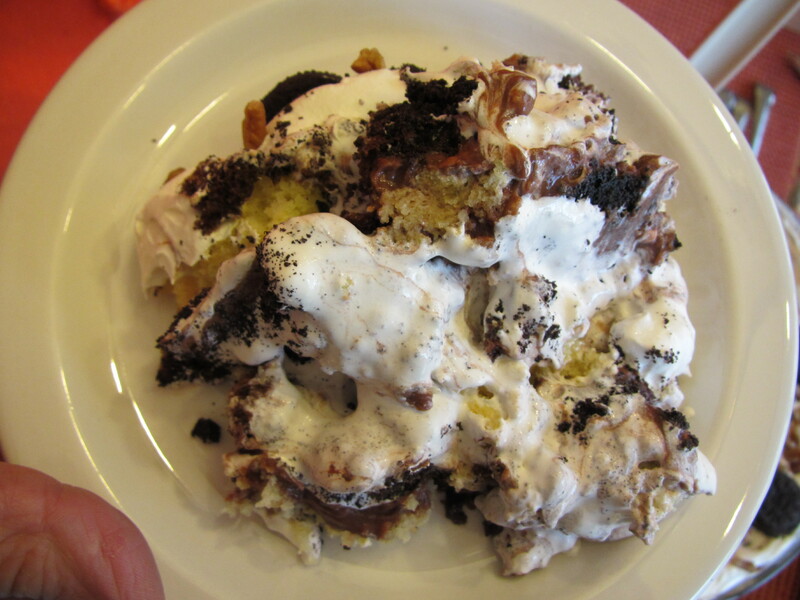 I randomly layered the cakes, pudding, Cool Whip (I used the Lite one) and Oreos, finishing with the Cool Whip on top. It helps to have a trifle bowl. 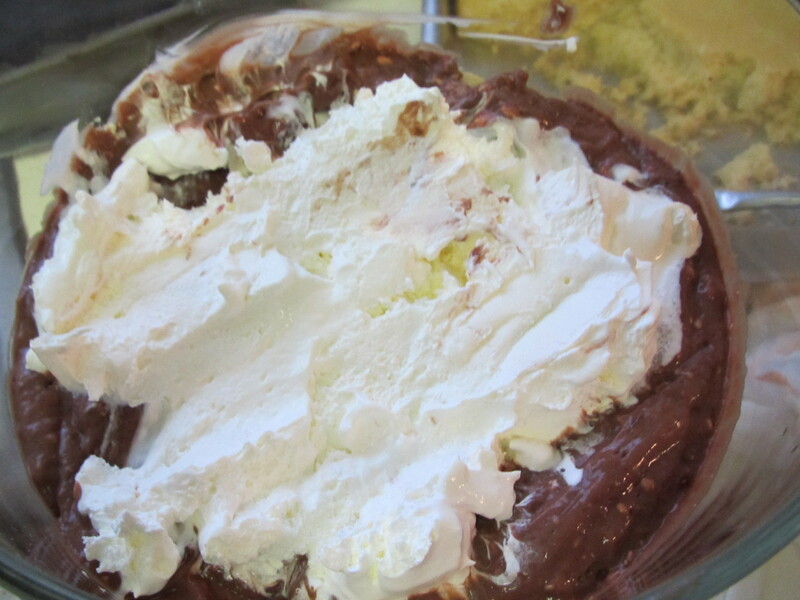 Now I know you are thinking…how often will I really make a trifle, but I tell you…once you make one, you will be hooked. 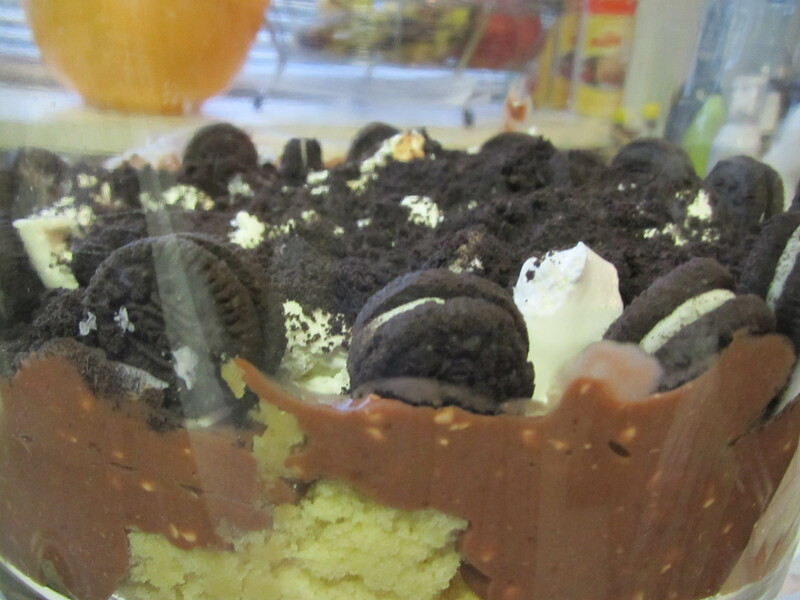 Plus the bowl is super fun for layered salads and dirt cake. The key is to try to make the layers smooth so that they look pretty from the outside. A little tip I’ve discovered, use a wet paper towel to wipe off the messes along the inside. 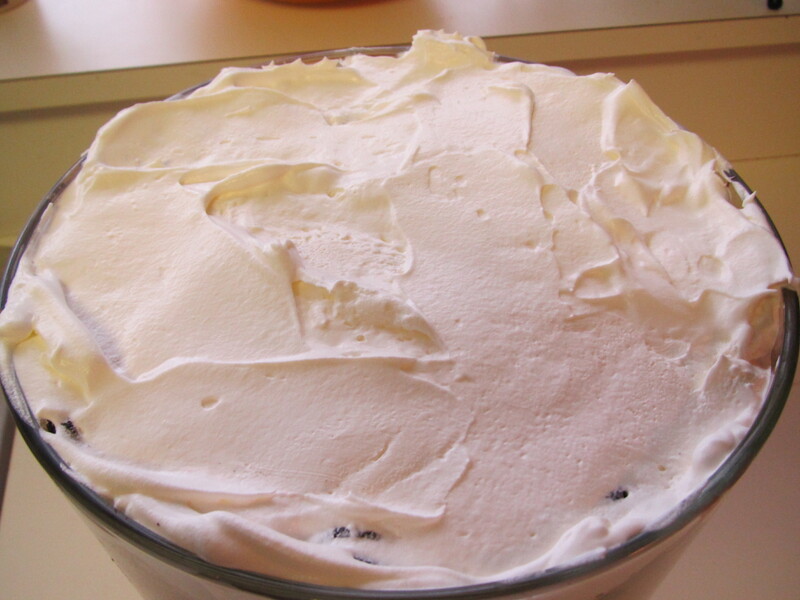 Ideally, your Cool Whip should be room temperature. I just got back from the store and so it was still too cold to spread well. 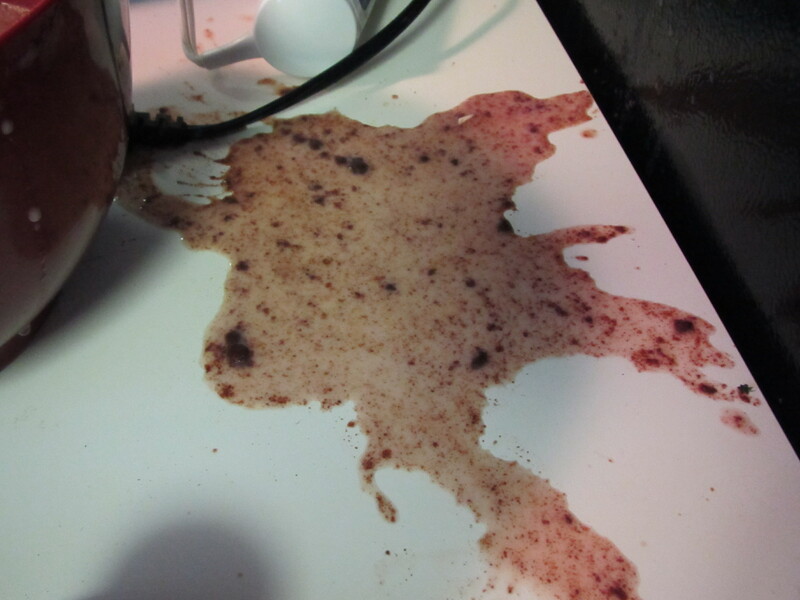 If this happens, you can run the container under warm water or try mixing it with a spoon. I definitely made sure my Cool Whip was smooth before spreading it across the top. 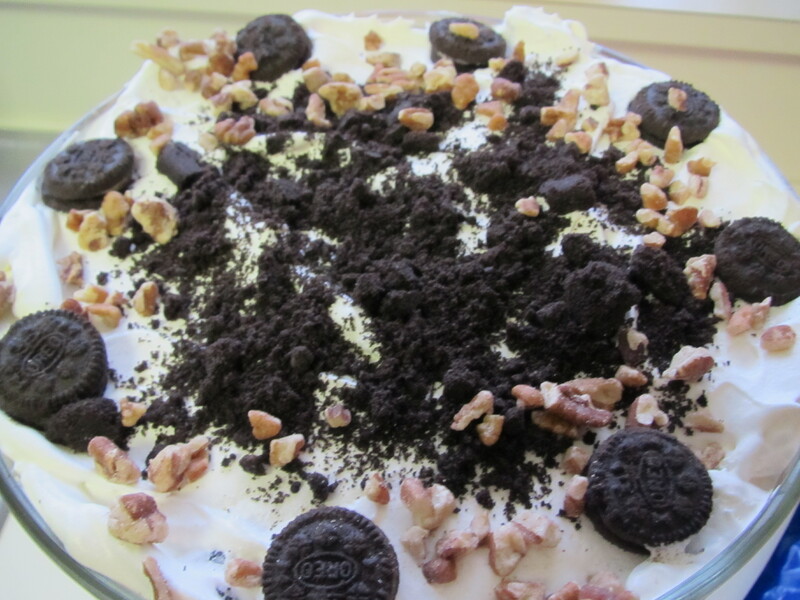 I topped the trifle with Oreos, crumbs, and pecans (for the requested crunch). Isn’t it beautiful?! It looks messy, but tastes SO GOOD! The best part (after eating the trifle of course) is licking the bowl and spoon!